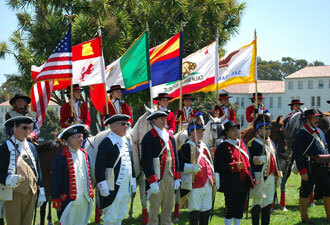 Amigos de Anza Equestrian Drill Team with re-enactors at the Presidio of San Francisco. 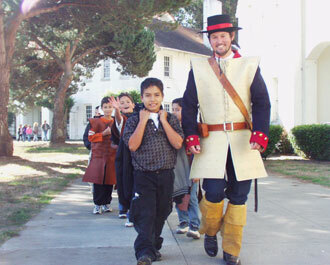 Fort Scott serves as a backdrop for children finishing the final mile along the Anza Trail at the San Francisco Presidio accompanied by a Spanish soldado de cuera. It's a lot easier these days than it was in the 1770s to traverse the Juan Bautista de Anza National Historic Trail corridor. Just hop onto some of the well-traveled highways in Arizona and California, and you're likely on the historic route or very close to it. The Juan Bautista de Anza National Historic Trail officially begins in Nogales, Arizona, and ends in San Francisco. But the route of the Anza Colonizing Expedition starts 600 miles south of Nogales, in Culiacan, Sinaloa, Mexico. The route proceeds north through the current state of Sonora, passing through towns and cities including Horcasitas, Magdalena, and Nogales. It took about eight months for the expedition of 1775-76 to travel from the Presidio of Tubac (in southern Arizona) to the San Francisco Bay, where Juan Bautista de Anza and his fellow travelers founded the Presidio and Mission of San Francisco. Today, driving at about 65 miles per hour, you should be able to travel the same distance a little more quickly, but be sure to stop and take in the natural features and historic sites in two states and 20 counties along the way. With some good friends or family members, you too may have an epic journey, like the over 240 settlers (about 100 of whom were children), who, with over 1,000 head of cattle, made up the Anza expedition. In southern Arizona, a walk along the Santa Cruz River, on the Anza Trail between Tumacácori National Historical Park and Tubac State Historic Park, provides a better understanding of, and appreciation for, the rivers in the Sonoran Desert. Indeed, the lushness of this stretch of the trail may surprise you. For a contrast, head to southern California. A visit to Anza-Borrego State Park and a walk along the Anza Trail within the park provide an experience of the desert landscape that the expedition members would have encountered. 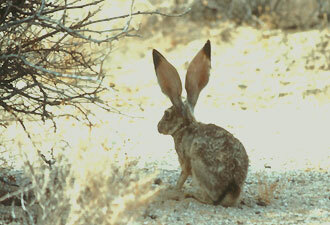 You can marvel at cacti and, starting in late February or early March, wildflowers. When you're ready to let someone else provide transportation, hop aboard Amtrak's Coast Starlight train between Santa Barbara and Oakland, California, for a Trails and Rails program. During the peak travel season (March–October), you will find dedicated docents from the South Coast Railroad Museum in Goleta, California, who also serve as Volunteers-In-Parks. They acquaint passengers with the Anza expedition and other cultural and natural history while the train travels along California's beautiful coastline. To complete your experience, visit the Anza Trail's first full-scale permanent exhibit. Located at the John Muir National Historic Site in Martinez, California, the 500-square-foot interactive exhibit is housed in the Vicente Martinez Adobe, built by a descendent of the Anza expedition. Presenting the expedition, its people, and its legacy, the exhibit includes perspectives representing the diversity of people who were on the expedition and the tribal communities whose lives were changed by Anza's journey.